There are some books you hear about so often that you begin to think, wrongly, that you might have read them. 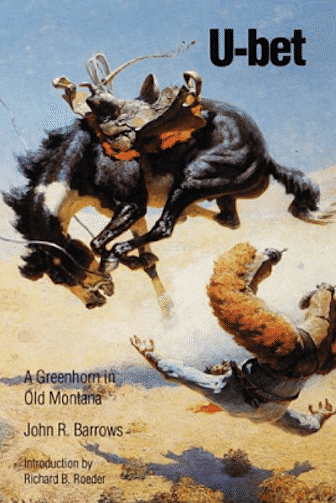 Such was the case with John R. Barrows’ “U-Bet: A Greenhorn in Old Montana.” When I came across another reference to it recently, I told myself I’d read it, but then I started to wonder. I wasn’t even sure whether it was on my shelves or not, so I went looking. I did have a copy of the book—a University of Nebraska softcover reprint from 1990—but a quick survey of the contents persuaded me I hadn’t actually read it. I figured it was high time I did. Barrows came to Montana from Wisconsin in 1880, joining the rest of the family here when he was just 16. After six months as a handyman at a trading post near Martinsdale, he signed on as a cowboy at the famous DHS ranch, run by Montana pioneer Granville Stuart. “U-bet” is the story of Barrows’ adventures as a cowboy during his five seasons at the DHS. A blurb on the back of the book says Barrows describes trail herding, roping and branding “with a mastery of language rarely brought to the subject.” I had read several times that it even deserved a place alongside E.C. “Teddy Blue” Abbott’s “We Pointed Them North,” one of my favorite Montana books. Now that I have read Barrows’ book, however, I feel that I must have missed something. The literary malady, unfortunately, was precisely what Barrows suffered from. He might have been a good cowboy, but his writing reeks of the dandy. “U-bet” is littered with this kind of windbaggery. I kept thinking of Francis Parkman as I read Barrows. Parkman, who would go on to become one of the best historians America has produced, wrote “The California and Oregon Trail,” an account of a two-month tour he made through Nebraska, Wyoming, Colorado and Kansas in 1846, when he was 23. He kept a journal during his travels and it is obvious that he relied heavily on them, because the writing changes dramatically in the course of the book. Once Parkman has been in the saddle for a few weeks and has begun to grow used to daily hardship and the dry, wide-open life of the remote prairie (he even hunts buffalo with some Sioux Indians), his writing becomes noticeably more vigorous and spare. You have to wonder if would he have become a great historian if he hadn’t made that trip. With Barrows, there is no transformation. He is as addicted to “fine writing” on the first page of his memoir as he is on the last. I have been called a lot of things before, but never a sobersides. I’m afraid I didn’t chuckle once; I don’t even remember smiling. I thought Barrows’ yarns, especially when he was relating yarns other cowboys supposedly told, had an air of falsity about them, with none of the matter-of-fact, profane simplicity always employed by Teddy Blue. So consider this a plea. If any readers would like to argue with me, in the comments below or in an email, I’d love to hear from them. Tell me what I missed, tell me what pieces of brilliance I overlooked. And in light of how relatively recently this book was written, given the short history of Montana, I apologize to any living relatives of Barrows who may happened to have read this. I was only judging the book, not the man.